Saturday morning started with the buzz of our little plane as we flew over the lakes, rivers, and volcanoes of the Alaska Peninsula. We were on the way to Port Heiden to traverse to Chignik Lagoon. I wondered about the odometer on the dashboard. 25,000 hours. How far is that? 250,000 miles? Or 10 times around the earth. Or, 2000 times as long as our traverse. The old plane bounced back into the sky and over wandering caribou, ponds ornamented with pairs of swans, and ground broken by the ice polygons of permafrost. 45 minutes later, Port Heiden's gravel airstrip came into focus thru the coastal mist. Hopping out, Grant's Village Agent Billie was waiting for us. At the Post Office we said "hi" to Meg, Dan, and Gavin then crawled back into Billie's van for the taxi service to the end of the road. At the river we started hiking towards the caldera. The first miles were a chore: splashing thru the boggy lowlands then swimming thru salmonberry bushes to the tundra. This approach can be skipped with an ATV ride, but that's not our style. Past brush line, we started to cruise up the flanks of the caldera. ...eventually getting to the point where bushes were smashed into 2-dimensional caricatures of themselves. Around 8:30, and approaching the snow line, we camped high above Bristol Bay. 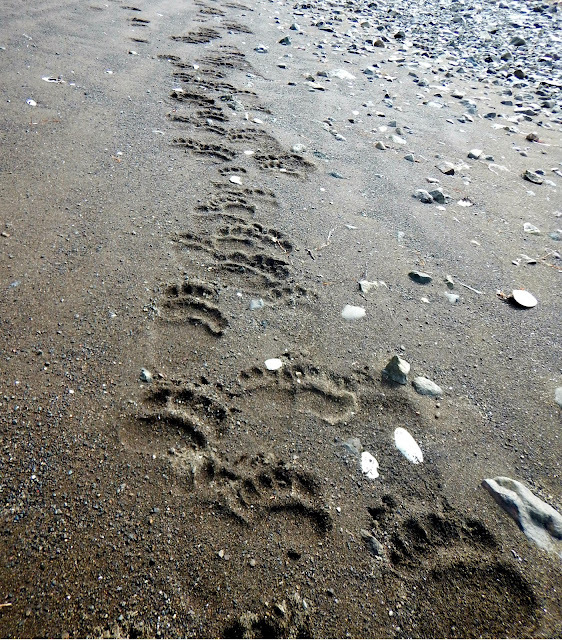 Sunday found us following the tracks of a momma and her cub towards the caldera rim. Above the elevation where green life could survive, steam rose off the saturated ground baking in the sun. At the rim, the sprawling six mile wide caldera came into view. In the distance was that night's campsite at Surprise Lake. After eating lunch at the rim, we started the descent towards the floor. We followed a long rib of scree, running thru the loose and forgiving soil. Before the long the windswept rib transitioned to snow, and we took the path of least resistance. The descent route deposited us near Vent Mountain, so it was a quick trip across firm snow to its base. From the lifeless top of Vent Montain we followed wandering tracks of a bear on its never ending search for food. Then, hooting with glee, we bounded down the steep snow plastered to the mountain's side. Back at our packs, it was time to look for a campsite at the lake. Under the supervision of the resident beaver, Alex made us chili mac with the crunch of Fritos for Sunday dinner. When we crawled into bed, the Black Nose was still bathed in evening light. Monday's breakfast was a potluck with the neighborhood fox. For humans: granola, for Mr. Fox: ground squirrel tartare. Once fueled up, we went over to check out the lake inlet. Clambering up a small lava dome, we looked down at a rainbow of color. From our perch, we watched as two caribou bands cautiously greeted each other in the lava flats below. 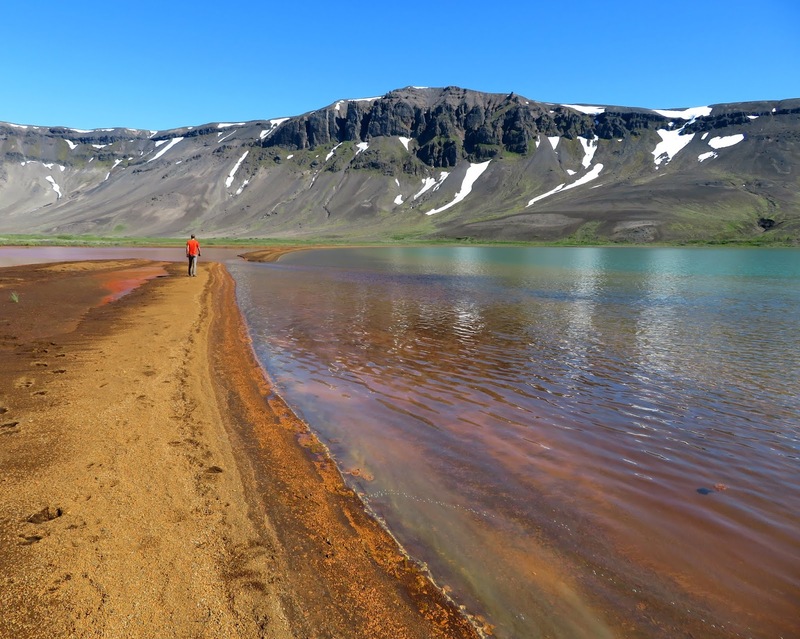 After returning to camp for lunch, we paddled across the lake to explore the far rim of the caldera. Pulling up to the north shore, the shallows were full of the darting shadows of salmon fry. Up the hill a fox was taking a siesta. 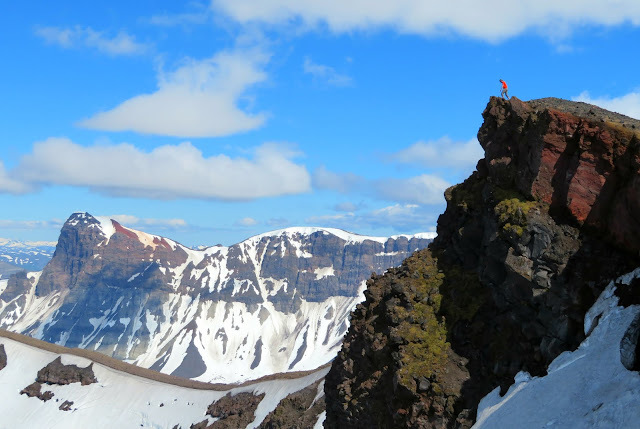 Without the weight of packs the hike up to the rim was quick and we were greeted with views of the Aleutian Range volcanoes. Below, groups of caribou moved seemingly aimlessly through the desolate landscape. With more miles to go, it was time to slide back towards camp. At camp, we packed up, chatted with Brooke who was in the midst of a 12 day backpacking trip, then paddled for the Gates. After an hour spent staring at rocks we were back in the river and quickly thru the Gates. They were awesome, but full of sieves and razor sharp rock - not consequence free. Some people have suggested that running the Gates without a helmet or dry suit is reasonable. There was approximately 600 cfs in the river when we ran it. It may be different at lower flow, and we both kept our gear in our boats, but helmet and drysuit are reasonable for this wilderness Class 3/4. I don't have pictures from running the Gates as my attention was focused elsewhere, but there are some nice ones on Luc's site. About two miles past the caldera exit we pulled out on the bank to camp. Across the way, we watched a loving mother encourage her newborn caribou calf. 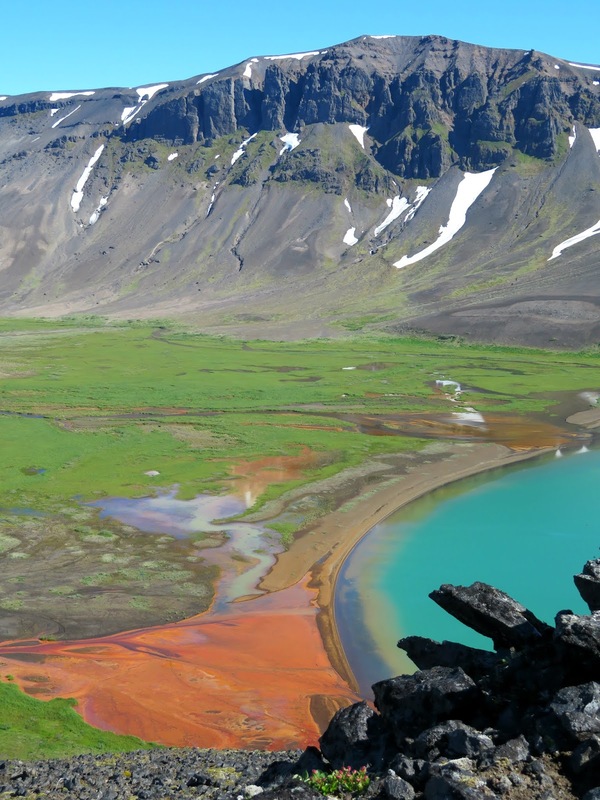 The famed Aniakchak winds were our alarm clock on Tuesday morning. After anchoring our gear to ground, we headed through fields of lupine towards the Black Nose. Climbing the mellow ridge towards the rim, one side of its loose rock eroded steeply below us. Hiking past crumbling rock pinnacles, this section was a real treat. We admired the broken and transient windows of weak earth barely clinging to the edge of our ridge. At the rim, the winds had shifted up a couple of gears. All around us were tracks left by caribou and brown bears. What had they been doing up here? The last segment of the climb was a free pumice facial scrub as volcanic rock whizzed uphill past us. Crawling on all fours to not be teleported directly back to Surprise Lake, we retraced our route. An hour later we were packing up camp and preparing to get back on the river. I'd expected the rest of the day to be full of fun and splashy paddling. A sharp rock and 14 holes in my packraft put a quick end to that merry plan. Alex provided free cheerleading services while I sheltered under his packraft in the sideways rain, fumbling with Tyvek Tape and slightly blue fingers. Tyvek Tape is amazing, and with the help of frequent stops to top-off and dump water we made it to our intended take out at Anderson Creek. The campsite was already occupied by several hundred swallows, who were happy to share the campsite, and even happier to keep the mosquitoes down. Peering out of Alex's tarp on Wednesday morning, the hurricane of the previous day had passed, leaving perfect weather for the traverse to Kujulik Bay. From the bluff above camp, Pinnacle Mountain was floating in and out of fluffy clouds. A family of brown bears watched curiously as we crashed swam thru bushes from one meadow to the next. Humans are weirdos. With Kujulik Bay now in view below us, we stopped at the pass for lunch and to regroup before more bushwhacking and swampdogging. The descent to North Fork Creek went smoothly where a bear highway headed towards the coast. I'd expected a slog thru a cobweb of sloughs and bogs, but following the paths of generations of bears we barely got wet. At the beach there were giant wolf and fresh bear tracks everywhere. With tracks nearly the size of an adult hand, these black wolves must be enormous. Along the beach there were beautiful pieces of petrified wood. Some still had root systems curled around the rocks that had once tied them to the ground, others were filled with colorful mineralizations. By 10 PM we'd found a small stream for water and ate dinner as the bay glowed. The next morning, within 5 minutes of leaving camp we surprised a family of brown bears to our left. Moments later there was another bear to our right, then another one in front of us. ...and giant boars fishing by themselves. Over the course of the day we'd see 22 bears. By evening we were at the head of the bay and cutting inland to avoid the rocky headlands of Hook Bay. It was intimidating to return to the dense vegetation after so many giant bears. Their trails didn't make me feel better. That evening we camped on a gravel bar next to Dry Creek. Paranoid about bears out of Jurassic Park, we carefully followed bear country protocol at camp. Friday morning started with the climb towards Dry Creek. Bear trails brought us to alpine meadows filled with clucking ptarmigan parents worrying over their young ones. Another bear highway brought us down towards the river bottom. Except this time it wasn't a highway; deeply incised in the soil, and covered by a roof of alders, it was more like a bear subway. Dry Creek was aptly named, and we used dry channels of cobbles to avoid the impenetrable brush. Near the coast we walked thru chest high meadows of cow parsnip filled with bear beds. 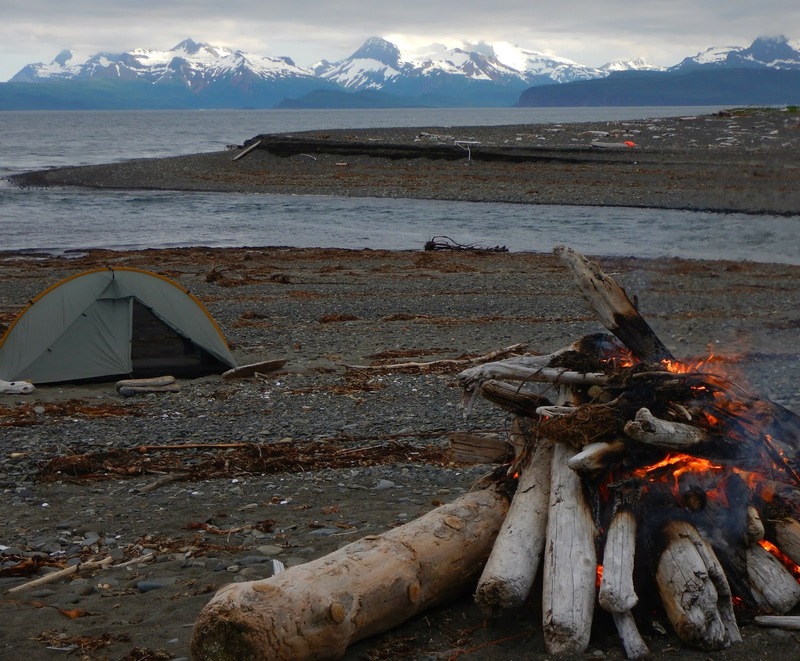 That evening, eating dinner next to a driftwood fire, we could see the lights of the Village of Chignik twinkling across the water. For dessert Alex served dolly cooked on a plank over the fire. For breakfast the next day there was cold wind, rain, and river crossings. 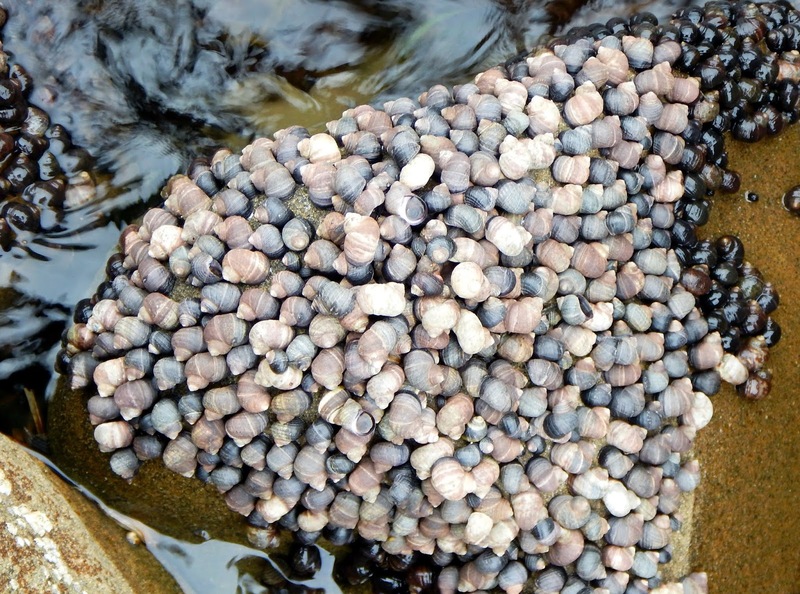 ...and beaches covered in clams. The locals in Chignik Lagoon told us about the 60 mile red tide they had just seen, too bad, clams sure are delicious. When they weren't covered in mussels, snails or seawood, the beach walls had spherical deposits as big as ovens. Late in the afternoon, cut off by a rocky point, we climbed one last bear trail to reach the Chignik Lagoon Spit. Immediately after leaving the beach we saw another bear. At the end of the spit we inflated our rafts while seiners rumbled past on their way home. After spending half an hour finding the three grains of sand that were preventing my cargo zipper from sealing we were underway. I do not like that zipper. Paddling thru the dense marine layer, the Village of Chignik Lagoon slowly materialized in the fog. By dinner time we were packing up our rafts on the village beach. Wandering down the street in the rain, an ATV stopped us to ask if something was wrong. That's a matter of personal opinion, but we weren't going to turn down an offer for floor space in their workshop. On Sunday morning, with winds ripping across the Alaska Peninsula, it was hard to believe Grant Air would ever land. When the ride home finally showed up, it was getting blown up, down, and every which way. Taking off into the bumpy air, we looked down on a landscape filled with memories of bushwhacking, bears, fossils, and laughter. - Lake Clark Air will ship spray/fuel on passenger planes on short notice. - Fuel should be in original retail container. - Call Grant Village Agent Billie S. to let her know your package is coming (444-4779). - Lake Clark will leave package in PortaPotty on runway if no one is there to receive it. - Cost should be roughly $40. 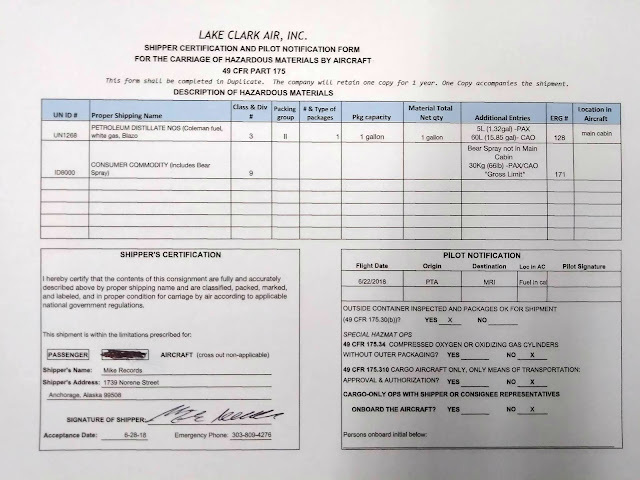 - If Lake Clark claims they can't ship it then ask to speak to someone else, keep asking until you find an employee who knows what they're talking about.